The accolades came pouring in from all corners of the word. The eulogies were eloquent until they weren’t. Without any fanfare Obama could not help himself at McCain’s funeral. He took the opportunity to go down on his knee if at a football game. We are talking about a president worse than scum, a class divider, a chicken little, a killer of millions in Syria, a defender of the guilty, a president who lied through his teeth while paying homage to his Muslim Brotherhood aficionados. And what did this low life individual say? Of course we know where Obama was coming from. Remember he defeated a “WAR HERO“. Trump might have added a little hot sauce when he said “heroes don’t get captured.” That may have been going a little too far. Having lost incredibly to Obama in 2008 set the stage for a more appropriate comment, one that would not have denigrated McCain’s service to the country; “McCain was a loser” got beat by a nobody by the name of Barack Hussein Obama. For years, McCain has been one of the most powerful voices in Congress advocating against torture; a position informed by his personal experiences at the hands of the North Vietnamese during 5 years as a prisoner of war. And McCain has consistently spoken out against torture during his run for president. John McCain did not plan the Vietnam War. He didn’t lie to the Americ an people about the nature of the conflict, the atrocities it entailed, or the probability of its success. He merely trusted the civilian leadership that did. There is no reason to doubt that McCain believed he was in Vietnam to risk his life — and then, to endure a living hell — in defense of our nation’s highest ideals. His willingness to sacrifice his own well-being to what he believed to be America’s interests deserves our awe-struck admiration. As the senator is laid to rest, one can reasonably argue that respect for his family, and legacy, compels us to isolate his act of transcendent patriotism from the indefensible war that produced it. … Americans began to treat those who served the country as heroic by definition, no matter what they had actually done … You no longer had to believe that the missions American “heroes” fought were noble and just; you could simply agree that anyone who “served America” in whatever capacity automatically deserved acclaim. Last year, when the commander-in-chief made his argument for prolonging the longest war in American history — a conflict in which the U.S. has neither a credible strategy for victory, nor significant national interest — he devoted much of his remarks to celebrating the sacrifices of fallen soldiers. … Our nation must seek an honorable and enduring outcome worthy of the tremendous sacrifices that have been made, especially the sacrifices of lives. The men and women who serve our nation in combat deserve a plan for victory. They deserve the tools they need, and the trust they have earned, to fight and to win. But what the “men and women who serve our nation in combat” truly deserve is a country that reveres their lives more than their suffering — and, therefore, that only asks them to endure the latter in wars that are just, winnable, and necessary. If we wish to honor McCain’s wartime sacrifice, we must remember it less as an example of the kind of heroism we wish to emulate, than of the kind of tragedy that our nation is duty-bound to avoid repeating. Proof that the Vietnamese were barbarians? Not really. If someone attacked the USA and started bombing us I doubt we would treat the captured any better. One has to remember that it is the USA who attacked Vietnam, this wasn’t like the Korean War where the north invaded the south. Though amazingly enough lots of Americans believe exactly that, I suppose I should have put it in my Ten American Myths post. No, the North was supporting insurgents in the south, so the USA picked a fight with North Vietnam thinking that a bombing campaign in North Vietnam and American troops in South Vietnam would prop up the unpopular South Vietnamese government. We all know how well that ended up, despite dropping more bombs in Vietnam than were dropped by all of the participants in all of World War Two, Saigon is now Ho Chi Minh City. War is tough, Senator John McCain knows first hand how tough it was in Viet Nam; a prisoner in the Hanoi Hilton for a half dozen years. But now McCain is fighting a different kind of war, not one for his life, but for his political life. McCain, a natural born RINO, is being challenged from within the Republican Party and from the outside too. McCain’s tepid endorsement of Trump has given an opponent from the other side the ammunition needed to bring him down. Also, challengers have arose in the Party itself. One of his opponents, Alex Meluskey, a businessman cited an internal campaign poll showing most respondents would be more likely to vote for a businessman who never ran for office over a career politician. McCain also is facing opposition from Kelli Ward, a doctor who resigned her state Senate seat last year to run full time for the U.S. Senate, she is pushing a campaign theme of “bold, fresh and fearless,” to contrast McCain’s status as a longtime Washington insider. 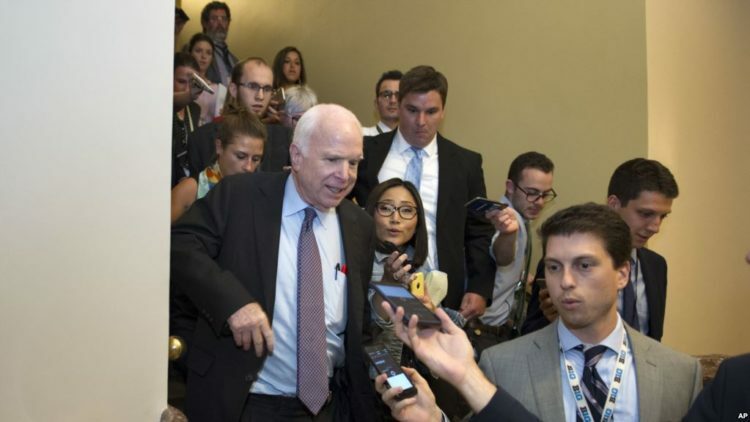 The Republican primary is Aug. 30, just one day after McCain turns 80. “The Donald” not only stirred the drink this past week, but in so doing he crushed the ice. Somethings are better said in private provided no open mike is nearby; a lesson that escaped Trump. But telling the truth exposes those who are politically correct. By coming down on Senator John McCain like a cheap suit, Trump has basically imploded his fledging campaign.